It may be the Fourth of July weekend, but for retired soldier Mercy Carr and Belgian Malinois Elvis, it’s just another walk in the remote Lye Brook Wilderness—until the former bomb-sniffing dog alerts to explosives and they find a squalling baby abandoned near a shallow grave filled with what appear to be human bones. U.S. Game Warden Troy Warner and his search-and rescue Newfoundland Susie Bear respond to Mercy’s 911 call, and the four must work together to track down a missing mother, solve a cold-case murder, and keep the citizens of Vermont safe onpotentially the most incendiary Independence Day since the American Revolution. 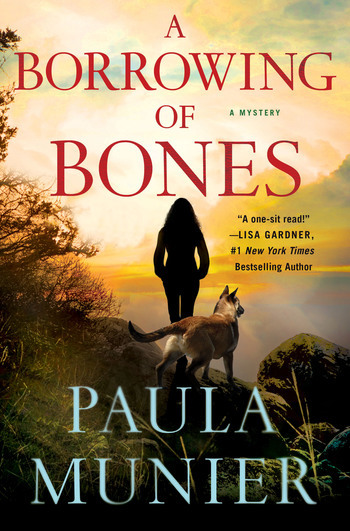 A Borrowing of Bones is full of complex twists and real details about search-and-rescue dog training that Paula has learned through the training of her own dog. With its canine sidekicks and procedural plot, this series is well-positioned to become “Julia Spencer-Fleming with dogs” and will be a must-have for mystery fans.